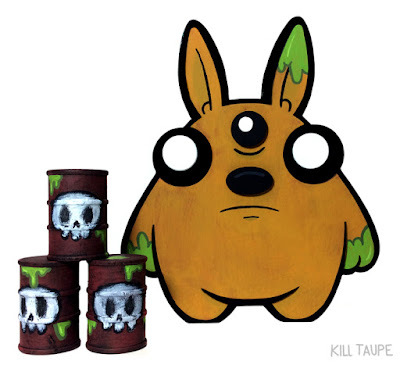 Urban Vinyl Daily and Detroit basaed artist Kill Taupe have teamed up to release a new series of 'Chunky Bun' pieces at Designer Con 2015. Kill Taupe's famous character will be available in a 5"x6-1/4"x1-1/2" painted wood cut out. 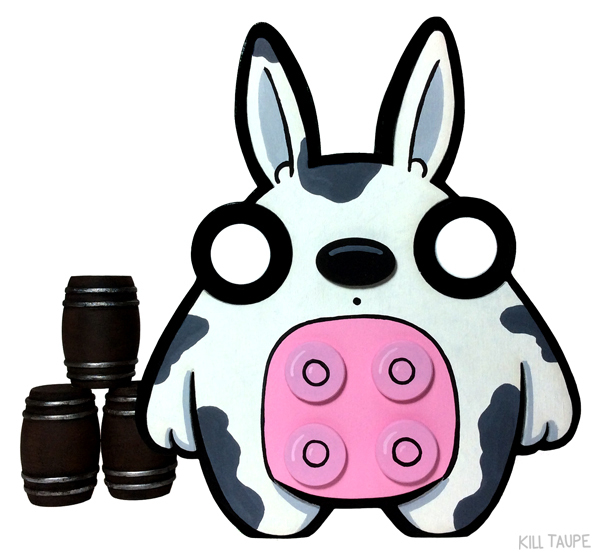 Available in two editions, the 'Toxic' Chunky Bun and 'Moo!' Chunky Bun, each limited to 3 pieces. To help accent each Chunky Bun, a stack of three barrels are included with each piece. 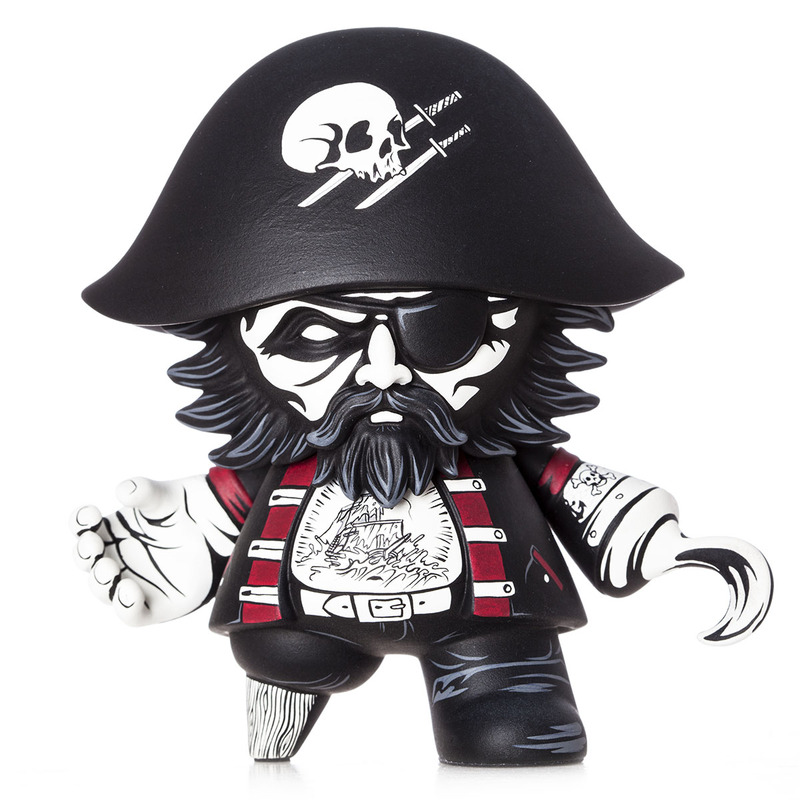 These will be available at DCon 2015, at the UVD Booth #707, priced at $75 each. Definitely a nice piece to add to any collection. For those attending DCON 2015, be sure to stop by the UVD Booth #707 and say hello. With Designer Con 2015 only a few weeks away, Jon-Paul Kaiser is still delivering commissioned pieces, while also prepping to make his trip over to California for DCON. 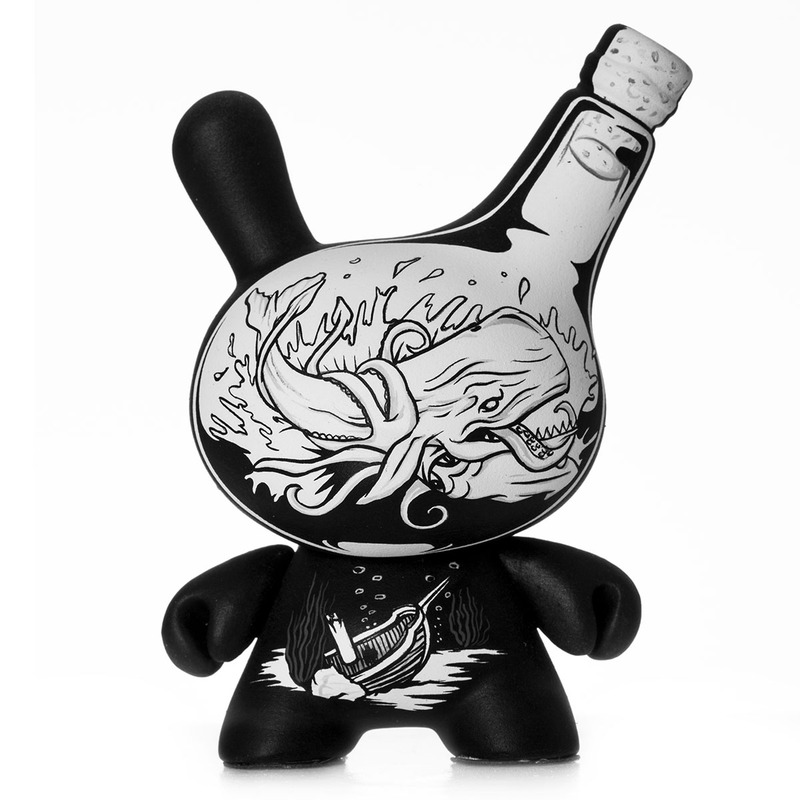 Jon-Paul's latest custom set is a nautical themed custom Sturnbrau and Sketchup Dunny set. This older Captain Sturnbrau continues to gather more tattoos and new emblem on his hat, signs of the distances traveled in his ship, the Whispering Corsair. A nice companion piece to Captain Sturnbrau is the Sketchup Dunny, which shows a battle between a sperm whale and a giant Kraken-like squid. With the epic fight taking place within the confines of an old grog bottle, the ship that once sailed the seas lay sunken on the bed of the sea floor. Photos were taken by Justin Allfree, with more photos showing up on Jon-Paul Kaiser's social media pages. This set makes a nice pair and is a nice primer for those who are going to be attending DCon 2015. Jon-Paul is sure to bring along a lot of goodies with him. So, for anyone within driving range of Anaheim, make sure to purchase tickets for DCON now. Buy ME GUSTA MEME 3.5-INCH DIY FIGURE BY HASHTAG COLLECTIBLES today! Our good friend Mike Slobot is being featured at Litmus Gallery in Raleigh, NC as part of “Anything Goes”. The Anything Goes 2015 exhibit showcases the works of more than 40 artists in an outstanding range of original visual art including traditional, contemporary, and avant-garde creations. See artists challenging traditional practices of visual art using a wide range of techniques, including paintings, photography, sculpture, and mixed media. Choices was created by Jermaine Rogers in 2014. Custom toy painter, SoKo Cat, has created her second custom Choices, entitled Dark Choices, that gives the piece a darker, more ominous feel while still maintaining a natural color scheme that highlights Rogers' brilliant texture. "Dark Choices", has been hand-painted using high-quality acrylics and washes, and comes signed and dated by SoKo Cat! It will be available for purchase from her online store this week, so be sure to keep an eye out for this drop because they will sell quickly! 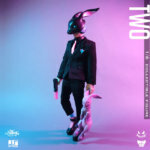 Only two of these unique 8" figures have been created! follow her on Instagram, and check out her store! DIY figure (do it yourself!) 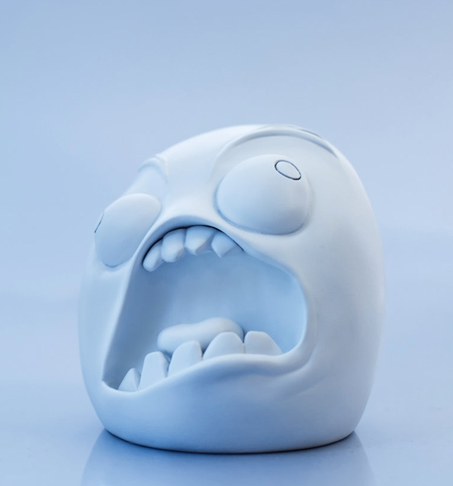 blank white figure of the "Rage Guy" meme! 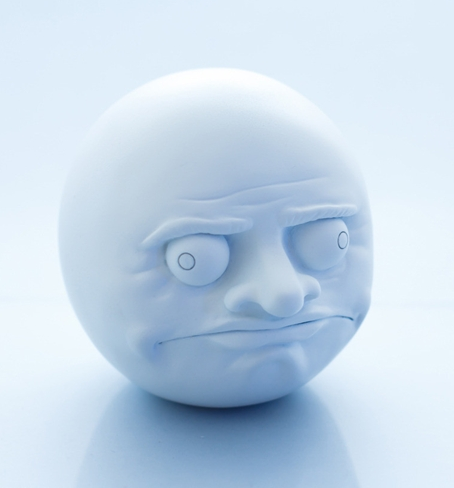 Buy RAGE GUY MEME 3.5-INCH DIY FIGURE BY HASHTAG COLLECTIBLES today! Set include 9 pieces: 8 pink Gachapon Goblins (all different) plus Sister May! Buy MICRO GACHAPON GOBLINS PINK 9-PC SET BY RAMPAGE TOYS today!